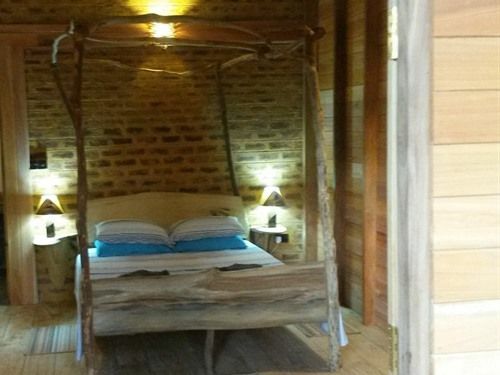 All double ensuite cabanas have a comfortable, handcrafted, king size four poster bed with mosquito net, wardrobe and chest of drawers and wooden floors. The adjoining ensuite shower room has electric shower, toilet with bidet and wash basin. In the wet room we supply locally sourced Ayurvedic Lemongrass shampoo and shower gel. Each cabana has it's own private balcony with chairs and a table. The cabana is light and airy with shuttered windows and two ceiling fans - one in the room and one on the balcony. Linens and towels provided are of a very high standard. The room also has hand crafted bedside tables with lamps and english sockets are provided (adapters available). Daily turn down service is provided and we can provide a laundry service (chargeable) if required. Our small, friendly, environmentally aware resort has everything the traveller tired of concrete and high rise hotels could wish for! Staying with us will see you in a jungle setting in a superior cabana surrounded by wildlife. We can offer a plunge pool and a restaurant offering a high quality, fusion menu. Our guests will enjoy the type of service not seen in hotels. We can also offer tours to meet your exact requirements – we don’t tell you where to go but are happy to advise, from the Buddhist Temple of the Tooth in Kandy to the incredible cave temples of Dambulla, the wildlife parks such as Yala and Bundalla, and the Udawawella Elephant sanctuary. Take the train from Ella to Nanoya Junction through the mountains and then down through the tea plantations where you will be offered a perfect cup of your favourite brew. If you prefer to explore more locally there is the Cinnamon Island a must first thing in the morning as you watch the sun rising. There is also a turtle sanctuary nearby as well as a working moonstone mine. For those that are interested there is also a large statue of Buddha built to remember the lives lost during the Tsunami on 26th December 2004 as well as a Tsunami museum nearby. Only a short distance away is The Longest Reclining Buddha - recently restored it is a wonder to behold. We are also only 20 minutes from Galle - a world heritage site and well worth a visit. The list of possibilities is endless and far too long to include them all here! explore Sri Lanka’s many natural and historical sites by booking one of our tours. Airport collection is also available. The resort is situated in a jungle setting just a mile and a half from the beautiful surfing beach of Narigama and a short stroll from there to Hikkaduwa beach offering a diverse range of good restaurants and cafés lining the beach front. There is good snorkelling at an easily accessible coral sanctuary which has amazingly flourished since the Tsunami, as well as scuba diving at a number of wrecks in the bay, tours by glass bottomed boats. There are also plenty of handicraft shops.